AIDC (www.aidc.org.za) working with the Transnational Institute (www.tni.org) within the New Politics Platform will host a series of parallel workshops on 15 March 2017 in Cape Town. These workshops will be attended by 25 researchers, public intellectuals and social and political activists from around the world, who will be able to compliment our own analyses and experiences with their considerable insights. The workshops will be followed by an international conference on The Crisis of Politics and the Politics of Crisis. Since space at this conference is very restricted we believe the workshops offer an opportunity to engage with the themes and issues the conference will be discussing but in respect to very concrete issues that popular forces are resisting and building alternatives around. The rise of the right and the growing difficulties faced by national progressive projects, including the apparent end of the cycle of left governments in LatinAmerica and the challenges encountered by the Syriza-led administration in Greece, brings the issue of strategy into central focus. The election of Donald Trump, a right-wing populist, as the US President, combined with the resurgence of extreme-right forces in Europe, makes the rethinking and renewal of emancipatory politics that more urgent. Clearly, the crisis of politics has its roots in profound changes that have taken place in recent years within the capitalist system internationally. Neoliberalism, globalisation and financialisation, together with a changing global division of labour, have shaped a new geo-political balance of forces that redefine both the opportunities and the challenges for radical transformation. new politics 2 The multifaceted nature of the global crisis, being at once economic, social, political, ecological and civilisational, has given rise to new struggles and new agencies. The crises intersect and reinforce each other and redefine the role of the nation state. They also remould social classes, pauperising and marginalising large segments of the population while elevating and co-opting others. They also profoundly redefine questions of identity and culture. Mass unemployment, the rise of precarious forms of labour, the growing pressures on the peasantry and the reduction of the weight of the industrial proletariat, redefine urban and rural spaces, restructure the reproductive role of women and bring into sharp relief our environment and the human species’ relation to the biosphere and nature in general. Hence, emancipatory projects are confronted with a series of new questions to which there are few clear-cut answers and certainties. In many countries, traversing these challenges while at the same time building a new political project within an increasingly divided and polarised society (current South Africa being a sharp example), has proven difficult. Doing so in a context of fragmentation and isolation, with little dialogue and interaction between different initiatives, would require much more time and efforts. The depth of the crises we face makes everything urgent and undermines the time needed for theoretical and intellectual work. This in part constitutes a significant element of what we refer to as the crisis of politics. Furthermore, the crisis refers to how the conventional ‘solutions’ (left political programmes) hardly match the changed realities we face today. Clearly, the power of globalised finance capital, and its capacity to disrupt national economies, makes taking institutional power and implementing radical reforms very difficult, outside of a generalised confrontation with capital nationally, regionally and globally. At the same time, recent developments bring inspiration about new forms of political organisation and action. 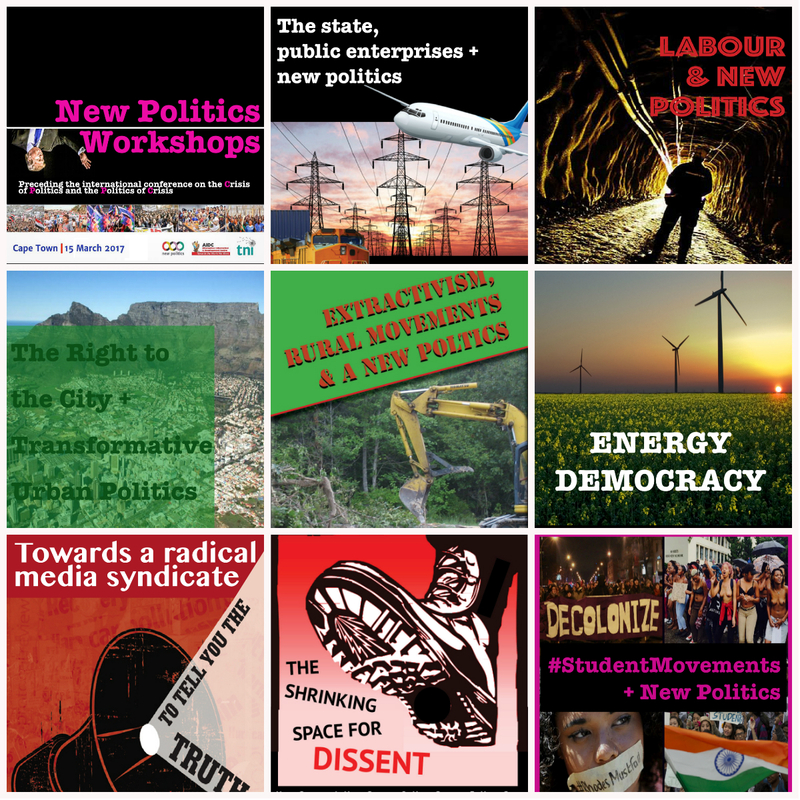 The new municipalist and commons-driven experiences in Spain, the Women’s Marchs, the Black Lives Matter movement and the Standing Rock resistance in the United States, and the initiative to build an international treaty to hold transnational corporations accountable for their human rights violations in the context of the UN system– among many other inspiring examples – show that there are winning strategies we can learn from, nationally and globally. Moreover, these experiences set new questions in the way emancipatory movements relate with the traditional media, but also in how to use new communication tools that are breaking a historical monopoly of production and dissemination of information.